Mrs botf and I headed to the West Village to join all the pretty young things. We planned to review The Biergarten. The place to go apparently and much like our Bavarian Beer Cafs. But there was a queue and being Australian I refuse to queue where I have a choice. 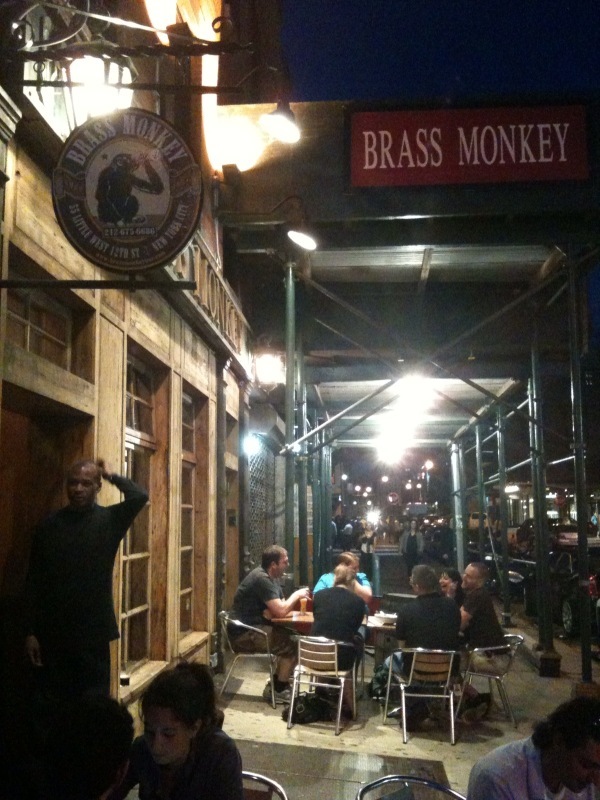 Luckily the Brass Monkey was two doors down and doing a thriving trade with like-minded patrons from the Biergarten. I was the only one not asked for ID. I like to think it was the accent and not the grey hairs. A fantastic range of beers on tap. I tried the Brass Monkey Ale and a Chimay. Both excellent with the Chimay a standout as usual. Been in US 5 days now and getting comfortable with the tipping. It really does mean “to insure prompt service” (thx Gerald). I tipped after the first order, probably a bit much, so on my second visit to the bar I was served prior to a row of waiting patrons in front and by two staff. This Aussie maybe handed over a 10 rather than a 1 previously!